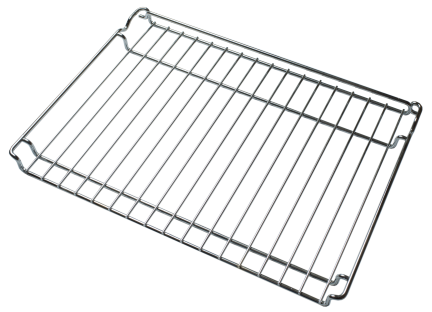 Two chrome-plated steel oven racks are included with each Lacanche oven (Cluny oven rack shown). Rack design allows Lacanche owners to remove dish-laden racks to “check and baste” accordingly. Safety-tip catch ensures rack is stopped prior to being over extended. To accommodate large roasts, a fully extended bottom rack will rest securely on corresponding open oven door.